in EM waves (c is the speed of light). Electromagnetic energy travels in waves that span a broad spectrum. These electromagnetic (EM) waves are ubiquitous, and without them life as we know it would not exits. EM waves form the foundation of the information age and the technologies we use every day: radio, television, consumer electronics, remote controls, cell phones, microwave ovens, X-rays and other medical technologies all use EM waves. EM waves transmit energy, but unlike water or sound waves, they do not need a medium to travel through. They move through the vacuum of space at the speed of light (about 300,000 km/s). EM waves have crests and troughs like all waves. The distance between consecutive crests is the wavelength. The number of crests that pass though a given point in one second is the wave's frequency which has a unit of measurement called the hertz (Hz), named after the great German physicist Heinrich Hertz. Hertz was the first to demonstrate the existence of EM waves and the first to send and receive radio waves. Radio waves, which have the longest wavelengths, are at the low-energy end of the spectrum and at the high-energy end of the spectrum, with the shortest wavelengths, are gamma rays. The other bands in between, ordered by decreasing wavelength, include microwaves, infrared, visible light, ultraviolet and X-rays. Its ironic that the band of radiation with the greatest significance to us—visible light—represents only a tiny fraction of the spectrum, from about 390 to 750 nanometers. Compare that to radio waves which range from a few millimeters to a kilometer in length or more. Our atmosphere filters out a large portions of the electromagnetic spectrum, but thankfully visible light passes through mostly unaffected. The range of wavelengths in the electromagnetic spectrum compared to sizes found in everyday life. 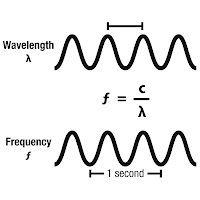 The frequency of any given EM wave is inversely proportionate to its wavelength: EM waves with long wavelengths have lower frequencies and EM waves with short wavelengths have higher frequencies. 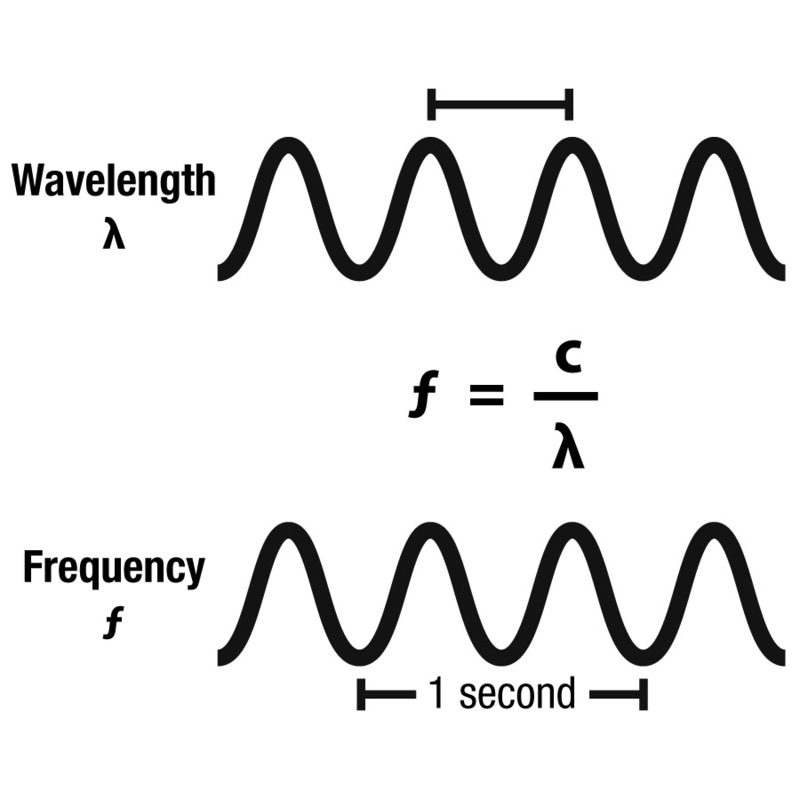 The equation that governs this relationship is ƒ = c / λ, where ƒ is the frequency, c is the speed of light, and λ (lambda) is the wavelength. So for a radio wave with a wavelength of one kilometer, its frequency would be 300,000 Hz or 300 kHz. In the United States, AM radio is broadcast at frequencies between 520 kHz and 1610 kHz. Using our formula, we can find that they correspond to wavelengths ranging from 186 to 577 meters. FM radio broadcasts at much higher frequencies: 87.8–108 megahertz (MHz). One megahertz is equal to 1,000 kilohertz, so that would correspond to wavelengths in the range of 2.7–3.4 meters—quite a difference! Over the next few weeks we will talk more about the various aspects of the electromagnetic spectrum, so if you have any questions related to this topic, let me know by posting them on my Facebook page.